Synopsis: Based on the true story of Cambodian advocate Arn Chorn-Pond, and authentically told from his point of view as a young boy, this is an achingly raw and powerful historical novel about a child of war who becomes a man of peace. When soldiers arrive in his hometown, Arn is just a normal little boy. But after the soldiers march the entire population into the countryside, his life is changed forever.Arn is separated from his family and assigned to a labor camp: working in the rice paddies under a blazing sun, he sees the other children dying before his eyes. One day, the soldiers ask if any of the kids can play an instrument. Arn’s never played a note in his life, but he volunteers.This decision will save his life, but it will pull him into the very center of what we know today as the Killing Fields. And just as the country is about to be liberated, Arn is handed a gun and forced to become a soldier. I read Never Fall Down by Patricia McCormick for very superficial reasons: 1. it was on sale the day I purchased it and 2. it was the shortest novel I owned, and I wanted a “quick read” to get myself out of my reading slump. I don’t think I even paid much attention to the blurb the day that I bought it other than it took place in Cambodia and something about the “main character”, Arn, dancing to Elvis Presley and hustling adults to bring home extra coin to his family. I mistakenly thought this was going to be a coming-of-age novel. Perhaps my obliviousness was a blessing because had I realized this book took place in Cambodia during the 1970s, I might not have picked it up on New Year’s Eve. I only vaguely knew about Cambodia during the 1970s– the Khmer Rouge and Pol Pot. It’s not something that I ever learned about in school though. All of my world history classes– high school and college– were western centric, so if America or the UK or the Soviet Union were not involved, we didn’t touch the subject– not even when 25% of a country’s population was annihilated by corrupt leaders. 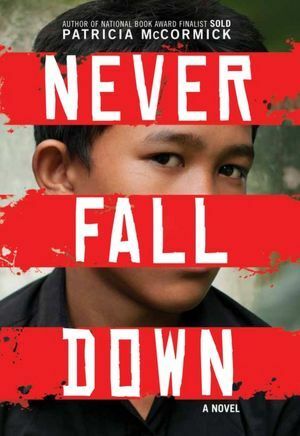 Never Fall Down is based on the (true) story of Arn Chorn-Pond, who, during 1975 and 1979, survived the genocide of Cambodia, the Khmer Rouge labor camps, and the Cambodian-Vietnamese War. This book is listed as “young adult”, but every page is filled with sights, scents, and sounds of death. Everyday, the Khmer Rouge kill people who are too educated, too rich, or too supportive of the old ways. The labor camps turn into killing fields and mass graves for over two million Cambodians, but Arn Chorn-Pond survives the fields because he volunteers to learn an instrument to play the patriotic songs of the new government and he learns to manipulate the members of the new regime. On the eve of Cambodian liberation, Arn Chorn-Pond is handed a gun and made to not only fight for the Khmer Rouge but for his own life as well. I have one reservation about Never Fall Down though, and it’s not the grim content– it’s the narration. Patricia McCormick spent two years interviewing Arn Chorn-Pond and surviving family members to learn their story, and in an attempt to capture Arn’s “authentic” voice, McCormick decided to write the entire story in broken English. Unfortunately, not only did it make this story difficult to read, I found the voice to be more like a caricature than authentic. It just seems…tacky, and perhaps I am putting that lightly. It was so unappealing and unnecessary that it turned a four-star book into a three-star book. Still, a book like Never Fall Down needs to be read. It’s a powerful story about a time in history that I think many of us are unfamiliar with. And that’s the thing about history– we read about it or experience it first hand and (hopefully) we learn and (hopefully) we don’t let history repeat itself. Oh man, I respect how you broke down the review here. I’ve heard WONDERFUL things about the book (and rightfully so, you say, because it’s a story that needs to be heard) but that sometimes trying to use a dialect isn’t the best choice for an author and they need to tell the story in a respectful way that makes sense to the reader. Nice insight! Your reasons for picking this book up notwithstanding, I think I’d enjoy the historical aspects of this story, and the characters sound well fleshed out. I’m just not sold on the broken English writing style, as I suspect that that’d be my main issues with this title as well. I’d have to check out a sample to know for sure. When you say “aside from the Vietnam War”, does that mean that’s not a war discussed in Australian classes or the approach to the subject isn’t a western-centric approach?